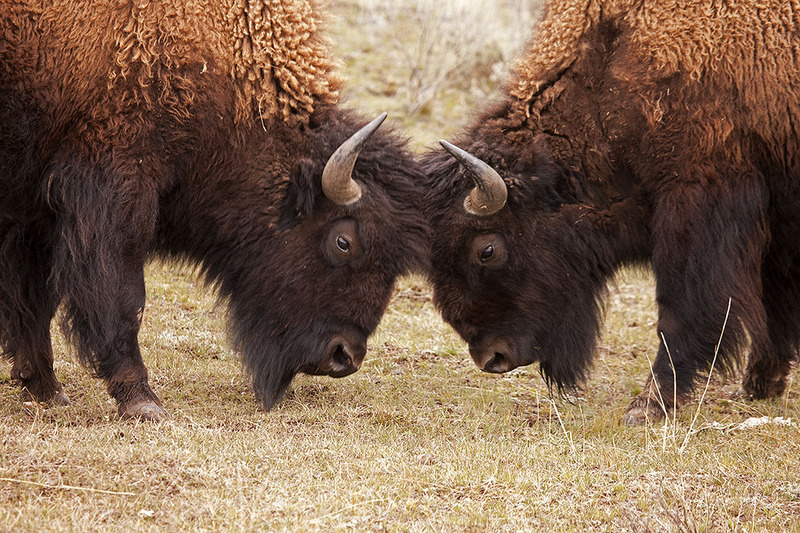 The iconic American Buffalo, or Bison (Bison bison), are a rich part of North American history, and efforts continue to preserve this magnificent species. Yellowstone has one of the largest wild, free-roaming herds in the states. Though they appear lethargic and awkward, these grass-grazing mammals will not hesitate to show a bad attitude and chase down anyone who provokes them. They have been recorded to run up to 35 mph, and can easily outrun a human. These two bulls are displaying aggression, typical in spring. During this threat posturing, if one turns his head sideways, indicating submission, the battle will end here. However, if they continue to clash heads, the fight is on!